On match day 2 the top 2 teams of last year’s Premier League met in the Etihad Stadium. Liverpool had a slight lead at the end of last season and an infamous 2:0 loss to Chelsea & a 3:3 tie with Crystal Palace allowed Manchester City to steal the League title from underneath Liverpool’s noses. Liverpool set out to prove that they can still be contenders for the title even after selling Suarez & buying many new players, while City looked to get a crucial 3 points against a top Premier League rival. This was a great way to see some of the new signings of both teams perform in a higher level match. The game had all of the excitement you’d expect from such a match up. The basic formations at the start of the match. 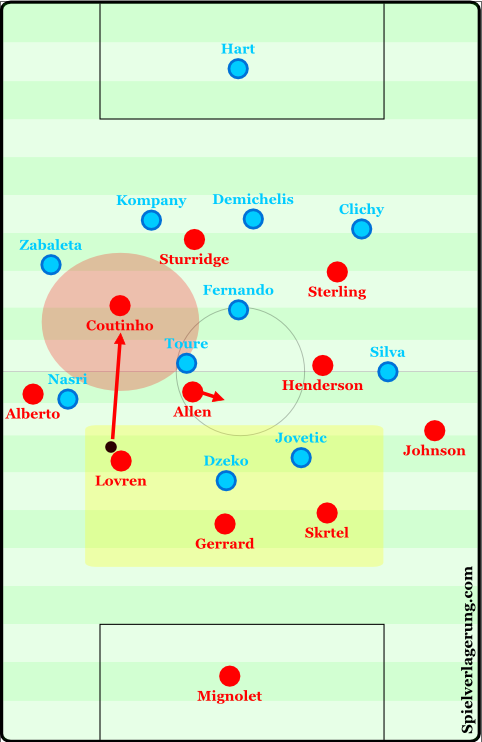 Liverpool came out in a 4-1-4-1 formation with Sterling and Coutinho on the wings moving inside. Gerrard played as the lone deep tilting #6 with Allen & Henderson just ahead of him as the #8s. The speedy new signing Alberto Moreno played with Johnson as the fullbacks and pushed high up the pitch & attempted to stretch the field horizontally. Sturridge played as the lone center forward, while also looking to drop deeper & link up with his teammates. Skrtel & the new signing Lovren started as the central defenders, with Lovren being more adventurous in his dribbling & his passes. Manchester City played in their usual 4-4-2 formation with the wide creative players (Silva & Nasri) moving inside towards the halfspaces. Zabaleta & Clichy started as the fullbacks pushing high up the field & stretching the pitch, with Zabaleta making some situational underlap runs through the defense high up the field. Dzeko & Jovetic started as the 2 strikers. Jovetic had much more of an involvement in the buildup play with his dribbling and passing ability. Jovetic became especially involved when Silva or Nasri dropped very deep, leaving Dzeko as the lone forward as he moved in and around the halfspaces. A familiar center back partnership between Kompany and Demichelis from last season started as well. Yaya Toure and the more defensive Fernando acted as double #6s in the middle of the field. Both teams had deep and passive defenses. There was never any intense pressure on the ball from either team until the ball moved to just in front of the defensive lines. The main aspect of both defenses was how open they were due to lack of compactness. Liverpool exploiting the lack of compactness in City’s defense. Gerrard’s main role was to drop in between the central defenders and create a 3v2 situation out of the back. This allows for the possession game to be built with an immediate numerical advantage. Lovren was the player who most often drove the ball forward with his dribbling & picked out sharp vertical passes. In terms of ball possession it was never too difficult for Liverpool to penetrate through the first line (& the following lines as a result of the advantage) & create good situations. 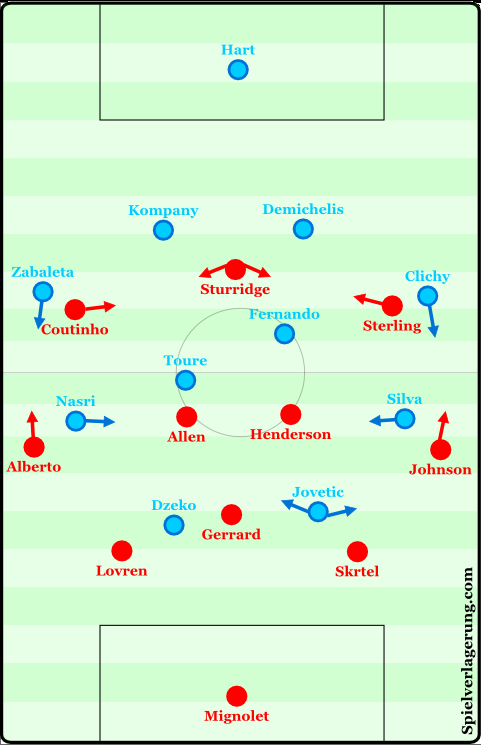 Liverpool often exposed the left side in the early stages of the match. Silva and Fernando on the right side were more competent in terms of understanding which zones to compromise for the opponent to take in order to maintain defensive stability. Nasri stayed pretty tightly oriented towards Moreno while Yaya Toure did the same with his opposing central midfielder, Joe Allen. When Lovren would break the first line and drive through with the ball, Allen would usually move toward the center (dragging Toure with him) leaving an excellent passing lane into Coutinho who was drifting inside from the flank. About half way through the first half of the match Pellegrini switched Silva & Fernando to the opposite side while Nasri and Toure went to Liverpool’s right. This was to stop the penetration of City’s defense in that zone. A few minutes later Sterling received the ball in the opposite halfspace (now the side of Nasri & Toure) & played a long diagonal to Sturridge who beat Kompany on the dribble and got off a nice shot on goal. City exploiting the halfspaces to either side of Gerrard. Thomas Muller once said that teams with forwards who do not work hard defensively are easy to play against. This can be seen as one of the main aspects of both teams’ defenses in this match. Liverpool played a man oriented zone defense. They waited to apply passive pressure to their man once the ball moved past the halfway line of the field. Kompany & Demichelis had an easy time moving the ball against Sturridge who was barely applying any pressure. Coutinho stayed tightly man oriented to Zabaleta (who was probably labeled as a danger man before the match) on the flank. Allen & Henderson would push up the field in order to apply some light pressure to Toure and Fernando. This would leave Gerrard on his own to control the space in front of the defense (very difficult to do unless you are named Sergio Busquets). Nasri and Silva mainly operated in the halfspace zones either side of Gerrard. Liverpool have played this way before in a deep 4-1-4-1 where they would leave the halfspaces open as the #8s pressured, & if the ball was played into that zone Gerrard would sweep across to shepherd the play towards one side, congest the play & eventually win the ball (with the help of his teammates) ‘collapsing’ with nearby players on the ball acting as a pressing trap in the halfspaces. Here Liverpool were too passive (with some players having different defensive roles) & a pass could be played into either Silva or Nasri with no real pressure & they could turn quickly & attempt to create an attack. Moreno would even sometimes step into midfield to try and provide momentary defensive stability in this area. Even so, both teams struggled to create as much quality chances as most would expect of them when facing only the back line of the opponent. This was mostly due to the general aspects of space congestion as the defensive lines were so deep that most through balls would prove unsuccessful & the area became crowded. This would then mean that the ball movement would have to become much quicker, the thinking would have to be quicker, and so on. This increased the probability of mistakes occuring. Coutinho would receive the ball in great areas & begin to attack, but was mostly uncreative & ineffective, while Sterling was much brighter on the opposite side when he had his opportunities. City were obviously much more clinical in their chances taken & also had more quality in these tight and creative moments. This is usually the case with Manchester City in these sort of open matches, they have much more quality & efficiency in attack than their Premier League opponents. There wasn’t many opportunities for good counterattacks in this match. Most possessions of both teams ended in a shot or a cross going out of bounds. As it was quite easy for both teams to move the ball and create advantageous situations, with clearances usually being won by the possessing team because everyone was behind the ball. If ball possession was ever lost while in play the entire back 4 & usually one central midfielder were already in a good defensive position for both teams in their defensive transition moments. So they would elect to build slowly rather than try direct balls into tight spaces, even though Liverpool had a couple of moments where they attempted to, while City didn’t have the pace to ever really threaten in that fashion early in the buildup. At halftime the score was 1-0 in favor of Manchester City, who remained unchanged. Liverpool came out with some minor changes in their offensive structure. Gerrard was no longer tilting so deep defensively as the #6, but was staying higher in front of the two central defenders & situationally helping them move past the City forwards. Both Allen & Henderson pushed much higher up into the halfspaces, which meant that Coutinho and Sterling stayed wider, or dropped deeper inside & diagonally during buildup. This didn’t cause a huge change in momentum, as Liverpool were still taking advantage of City’s unstable defense but were never able to create great chances or finish (same as the first half). The new signing Markovic came on for Liverpool in place of Coutinho. Immediately Liverpool looked more dangerous and creative in offense. Then Navas came on for Silva & Aguero also came on in place for the injured Edin Dzeko. This caused some minor changes as now Navas remained wider & Aguero took up more of a linking role in the buildup, while also offering fast direct runs in behind the defense. This was immediately apparent as Aguero scored in just 23 seconds after entering the field to make it 3-0 and wrap up the game. Navas was wide and deep during the early buildup, he received the ball & Moreno came jogging out to apply passive pressure to him (now a longer distance to cover as Navas was so far wide). Because this was early in the buildup and Navas was the first vertical pass City made out of defense, Liverpool’s defense was still high up the field. The space created by Navas’ dragging Moreno out was taken advantage of immediately by Aguero who made a quick run in behind the defense through that space. Navas was allowed to turn and face play because of the nature of the press & play a direct pass into Aguero’s stride. The last few changes of the game were Can coming on for Allen, Lambert for Sterling, & Fernandinho for Jovetic. Nothing changed structurally with the Can substitution, though he looked brighter than Allen had. Lambert came on for Sterling & Liverpool changed into a 4-4-2 formation with a larger focus on wider combinations & crossing. Daniel Sturridge made a run out of the center into wide halfspace & beat Demichelis before he crossed into Lambert for the goal to make it 3-1. Fernandinho came on for Jovetic and City changed to a 4-4-1-1 formation with Yaya Toure supporting in behind Aguero & Fernandinho in the center with Fernando. Overall it was quite an open match & the result was most likely a bit unfair. With Liverpool’s brand new signings (including Balotelli on match day) they will look to learn and improve from this result. City will feel confident that they beat their rivals 3:1 & showed their scoring ability. It will be interesting to see how both City and Liverpool develop through out the season. If City will be able to repeat its championship run with such a defense coupled with a talented offense, & what system(s) Rodgers decides is best for Liverpool in their attempt to win the Premier League Title this time around. Nice piece, i agree totally. Nice you are on board with the Spielverlagerung crew. so nice , I agree in many points !